It's Michelle here again with some more DT inspiration. I hope you are are warm and dry wherever you are - the weather was so bad here in Auckland I literately had a river running through my backyard and a waterfall water feature on my drive ! I can't wait to scrap those photos!! For my DT inspiration this month I am going to share with you a mini book I am creating using October Afternoon's Here & Now 'Today' Chipboard Album. This is what the album starts off looking like. What I love most about this album is that it is such a neutral starting point, it comes with more than enough lined inserts which make the perfect backdrop for your journalling and also for your photos. The 5 x 7" size makes it perfect for scrapping 6 x 4 " photos or smaller (as I have done). 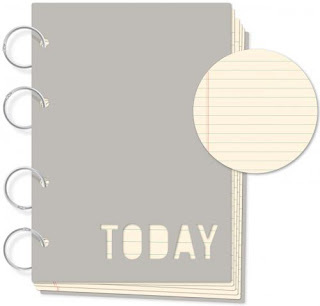 This chipboard album could be used for a multiple mini book topics... from documenting what your life is like 'today' to holidays and special events. Along with the above album, I also received the 'Here & Now' Chapters which come in three different themes which match in with the 'Cakewalk', '9 to 5' and 'Woodland Park' collection kits. I received the newest collection Woodland Park which has gorgeous sea greens, limes and earthy tones which made it a very easy decision to scrap our last year's inaugural camping holiday to Hahei beach on the Coromandel Peninsula. To accompany, the chipboard album, there are the Here & Now Chapters - these include four coloured divider tabs with a neutral grid pattern on the reverse side (more about those in a second) as well as two double sided die cut pages and 9 double-sided patterned pages. 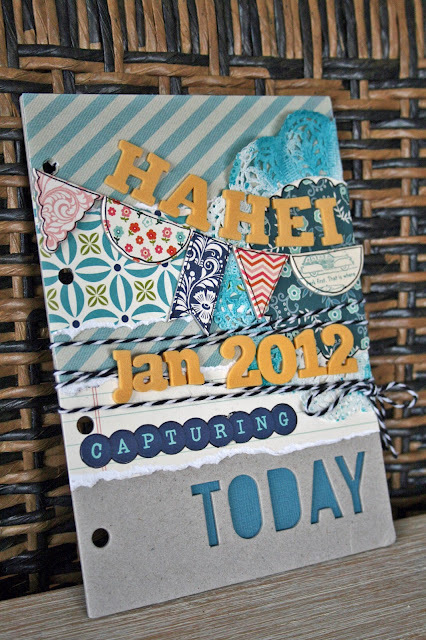 Lastly, I wanted to share with you what I have created with the four divider tabs in the Here & Now Chapters. As there were 4 dividers in this set it fitted perfectly with the idea that I could use 1 divider for each member of our family on holiday, include a photo and on the grid patterned back, get each family member to journal their holiday memories. I wanted to keep these quite simple, each divider actually has the words 'Name' and 'Date' on them but as I wanted to just use 'Name', I just placed a strategic piece of washi tape under the alphas to cover over the word 'Date'. I just added a few little heart felt embellishments to create a more layered look. That's all I have to share for now... I hope you have enjoyed learning about more about the October Afternoon Here & Now Chipboard Albums. I am still busy creating more pages for the insides of the book and I will be back to show my progress later on in the month.